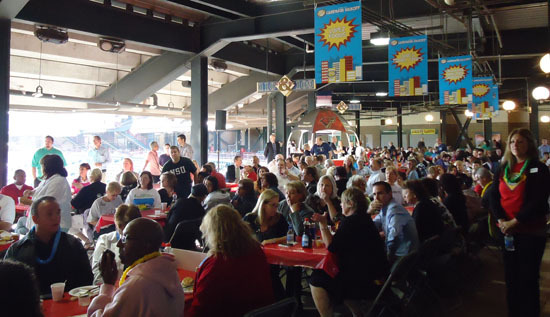 United Way of Central Oklahoma, the Central Oklahoma Combined Federal Campaign, the State Charitable Campaign, and the Heart of the City Campaign officially began their 2011 fundraising campaigns Friday, September 9 at a pancake breakfast at RedHawks Field at Bricktown. At the morning event, Campaign Chair, Martha Burger, announced a fundraising goal of $21.2 million before a crowd of more than 850. The c ommunity campaign runs September 9 through November 18, 2011. That evening, RedHawks Field at Bricktown held a movie night for the United Way of Central Oklahoma donors, volunteers, and employees. Guests enjoyed popcorn, snacks, and drinks while watching a movie from the outfield grass. Guests enjoying pancakes cooked by local celebrities and public figures. 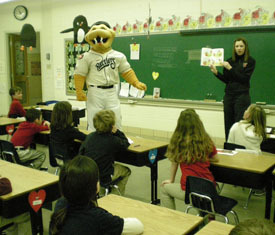 The Wisconsin Timber Rattlers, in partnership with local schools, strive to emphasize the importance of reading by encouraging youth to read regularly. Offering an incentive- based rewards program in conjunction with great family entertainment can only enhance this education experience for students, teachers, and families alike! This past season, over 160 schools/libraries and 38,000 students participated in Fang’s Reading Club. 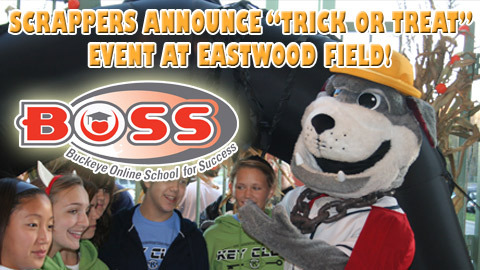 All students that complete the program by reaching their individual reading goals receive a free ticket to a Timber Rattlers game in April or May. 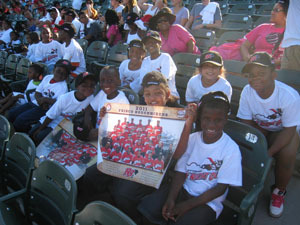 Many schools choose to pick a “Family Night” where the entire school is invited out to the ballpark. In addition, students are encouraged to participate in the Goodwill Book Drive and bring any new or gently used books. 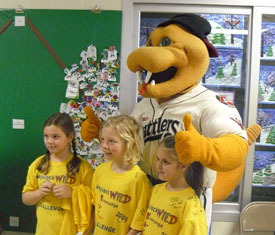 For the 2011 season, the Timber Rattlers collected 1400+ books through Fang’s Reading Club. All books donated are given to Goodwill Industries for distribution. In turn, the donations help support programs and services that enrich individual lives and our communities! Thanks to the Charleston RiverDogs and Firefly Sweet Tea Vodka, fans were able to enjoy the great atmosphere of The Joe with the club on the road. Through three separate Party at the Joe events, Lowcountry residents savored great drink specials and heard from some of the best local musicians in the area. While relishing in those good times, those in attendance also lent a hand to the Winwood Farm Home for Children, an Awendaw based center which provides therapeutic residential services to hundreds of abused and neglected children. 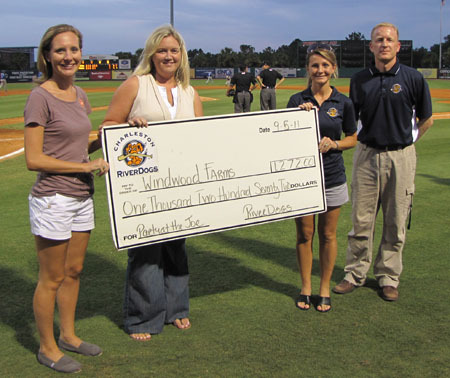 During Monday night’s game with the Asheville Tourists, RiverDogs General Manager Dave Echols and Director of Special Events Melissa Azevedo presented a donation worth $1,272 to representatives from Winwood Farm. “All three of our Party at the Joe events were well-received by our fans, and we are thrilled to help Winwood Farm in their mission to provide a safe haven for children in need,” said Echols. Winwood Farm Home for Children has been restoring hope to children for more than 25 years, since 1985. In that time, staff at Winwood has afforded hurting children a reason to smile, stand tall, and laugh while simply being a kid. School supplies are vital toward providing a great education for all children, but they can be expensive. In the Lowcountry, that’s where the Teacher’s Supply Closet steps in to provide pens, pencils, crayons, notebooks, and the like to Tri-County schools. 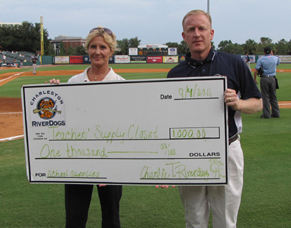 During Sunday’s game with the Asheville Tourists, the Charleston RiverDogs presented a $1,000 contribution to the organization as the culmination of a year-long effort to boost their ability to outfit children with everything they need to succeed in school. The funds come from the money fans have paid to have their messages read over the public address system. Everyone needs someone to lean on in a time of need. For Lowcountry residents, the chaplains and volunteers of the Coastal Crisis Chaplaincy have answered that call by fulfilling their mission to serve, comfort, and minister since 1991. 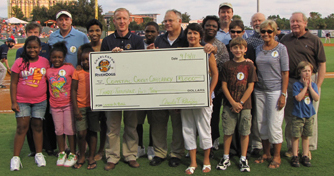 On Saturday, September 3, the Charleston RiverDogs and Raising Cane’s restaurant were happy to announce that they have assisted the Coastal Crisis Chaplaincy through the club’s nightly launch-a-ball promotion. By purchasing tennis balls to lob onto the Riley Park diamond during the postgame, fans have contributed $1,500 to the organization. Thanks to a matching offering from Raising Cane’s, representatives from the restaurant and RiverDogs General Manager Dave Echols were able to present a $3,000 donation to help fund the generosity of The Coastal Crisis Chaplaincy. The 2007 Sofa Super Store fire which claimed the lives of nine of the Holy City’s bravest firemen was just one of the many times the Coastal Crisis Chaplaincy has emerged to provide moral support in a time of crisis. The 24-7 pastoral care and counseling service tends to the families of law enforcement and emergency service agencies, as well as the general public, on an almost daily basis. Win a scholarship at College Preview Night! 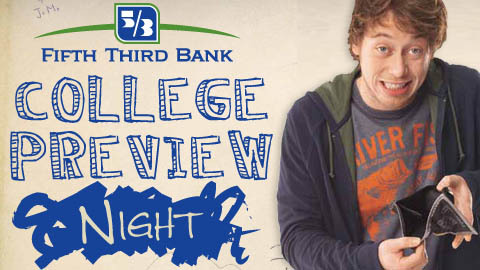 Come visit with top colleges and universities at the Fifth Third Bank ‘College Preview Night’ event, taking place at Fifth Third Field on Thursday, September 20 from 5:30 – 7:30 p.m.! Enter to win one of four scholarships, too! Details and RSVP info at www.mudhens.com/collegenight. 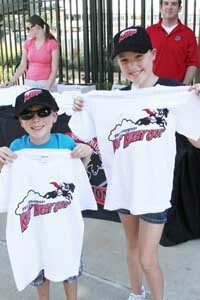 The final Friday Night Fireworks display of 2011 was not the only home run the RiverDogs hit with Piggly Wiggly last night. During a special in-game ceremony, the two announced that they teamed to donate more than 3,600 pounds of food to the Lowcountry Food Bank this season. Representing more than 3,000 meals, the contribution is the culmination of a year-long effort to aid the poor and hungry of the Lowcountry. All season long, RiverDogs fans have received a $1 off the price of admission by bringing three canned food items to the box office. The 1,500+ meals given by fans were then matched by Piggly Wiggly, doubling the total and lending support to the LCFB’s nearly 30-year long mission to feed the hungry.